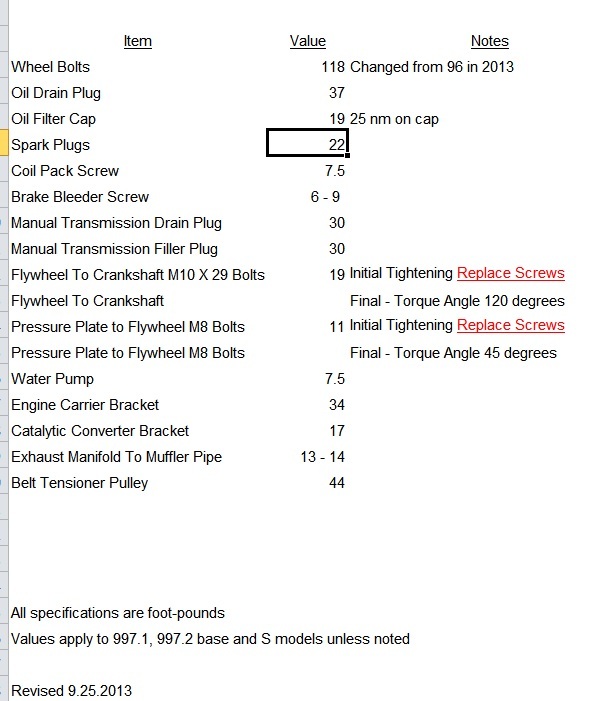 I was wondering if it would be useful to put together bolt torque specs for the 997. Not every bolt on the car, but the most common bolts that are removed and tightened in common DIY projects. I'm not certain how much variance there is between models and years, but I would think a simple spreadsheet would suffice. What do you think? Here are the values I have. Let me know of any corrections or additions. This is great idea as I am always searching for proper torque specs. If there is enough interest perhaps this could be put at the top of the 997 list adjacent to USMC_DS1's DIY Sticky. Wheel Bolt Torque 96 ft-lbs. 997.2 Coil Pack Screw:	7.5 ft-lbs. Recently someone offered that the wheel bolt torque values have gone up to something like 110 lbs. That's a big change for Porsche. I don't have access to torque specs but I'm willing to start a spreadsheet to collect information. We can figure out what to do with it later. I assume some specs might change between base and S models and perhaps some differences between .1 and .2 models. Please feel free to post specs and I'll record them and periodically post the results so that they can be checked for correctness. This is a great idea RichFL. I would only suggest that you add the chart to your post #1 at the beginning of this post and edit as you collect additional torque values. If you'd like I can have this post added to our DIY/Tech sticky under reference materials. BTW, here are some t-values from the WP DIY. Will do. You and I corresponded last week about floor jacks and I appreciate the information you gave me. You have to wonder what happened. The number 94-96 foot lbs has been associated with Porsche wheel nuts (and later bolts) for literally decades. Now this? And retroactive to the 997 cars. I'm replacing all pulleys and in need of the upper and lower idler pulley torque specs if anyone has them. Got the belt tensioner pulley specs so I'm good there. Keith - I can't help you with the specs you need, but can you post the belt tensioner pulley spec and I'll add it to the first post. The L&N Engineering magnetic oil drain plug is 19 ft/lb. The factory oil drain plug is 37 ft/lb.